I get asked questions all the time. As a wife of twenty-six years, a mom of ten—seven having been adopted, a homeschooler and a writer of over 60 books people want to know how my life works. Here is one of those questions and my short answer. More to come in the coming weeks! You are good at doing it all. How you do everything (mom, wife, homeschool, etc) AND have a home business?? —Stephanie L.
Tricia Goyer I often wake up early to write. I hire a babysitter sometimes during the day to write. I answer emails in chunks and do the best I can. I always have a few writing projects going on and somehow am able to get 2-3 hours of work in. I squeeze it in as I can! We homeschool together from about 9:00 – noon. The kids do independent work after that until 2:00 – 3:00. I’m normally always available to help as needed. Oh! I also have tutors come in to help. I have some awesome friends who’ll come from 2-4 hours a week to teach a specific subject. It’s SO helpful! 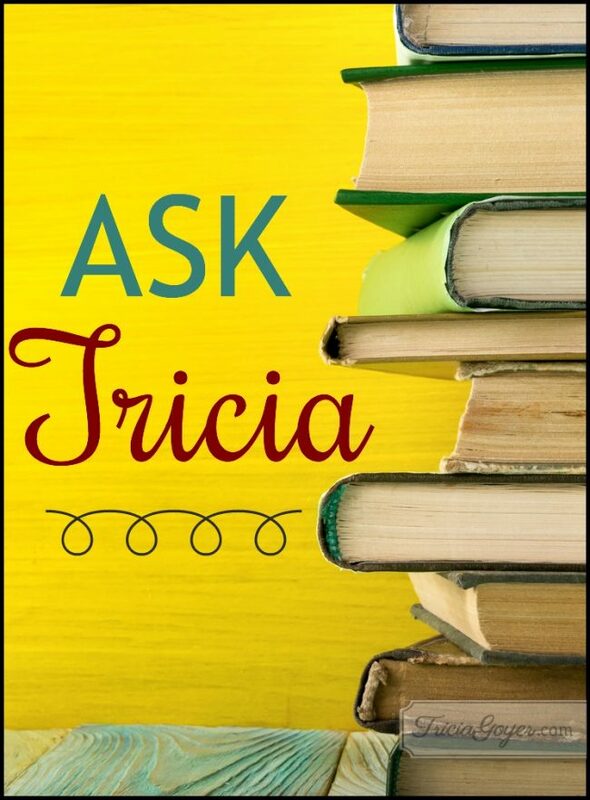 Do you have a question for Tricia? Congratulations again! Please email Christen (amy@triciagoyer.com) with your mailing address! Always enjoy your posts. Your kids must be so disciplined. I worked away from home while my husband worked on his doctorate. I would leave assignments for the kids to do but they didn’t always get them done while I was at work. Dad was busy with his own studies! My hardest thing in homeschooling was keeping records for each child. It’s a good thing that they took the GED or didn’t need to. One son went into the Army. One son got high honors at Missouri State and has a great job– all while married and having two boys. Or daughter got married , has three kids and works at a library and they are helping her to get her GED. But she got her pharmacy tech license on her own. Our youngest son is a computer whiz and is making good money at a corporate office in St.Louis. When he took his GED they told him he got the highest score they had ever seen. Do your kids have to take a GED according to stipulations in your state? How do you handle record keeping. Do you grade your kids or use a service? I bet you can grade compositions and essays like a champ!